Hundreds of Holocaust survivors around the world marked the third night of Chanukah on Tuesday, with menorah-lighting ceremonies paying tribute to them and the 6 million other Jews who were killed by the Nazis. “All of us here who’ve listened have a responsibility to tell your stories to successive generations,” he added. Greg Schneider, executive vice president of the Conference on Jewish Material Claims Against Germany, said that more than seven decades after the end of World War II, it is more critical than ever to keep the memory of the Holocaust alive. In Berlin, several hundred survivors and relatives packed the German capital’s biggest Jewish community center for a dinner of turkey and rice, washed down with Manischewitz red wine, before lighting a menorah on stage. Sara Bialas-Tenenberg, a native of Czestochowa, Poland, who survived 4 ½ years in the Nazis’ Gross-Rosen concentration camp, said even though it was good to be among people with whom she had so much in common, the event was “not easy” for her. “I was just a child then, 13 years old, I knew nothing of the world and I’d never been away from my parents,” said Bilas-Tenenberg, who turned 91 on Tuesday and has lived in Germany since 1961. 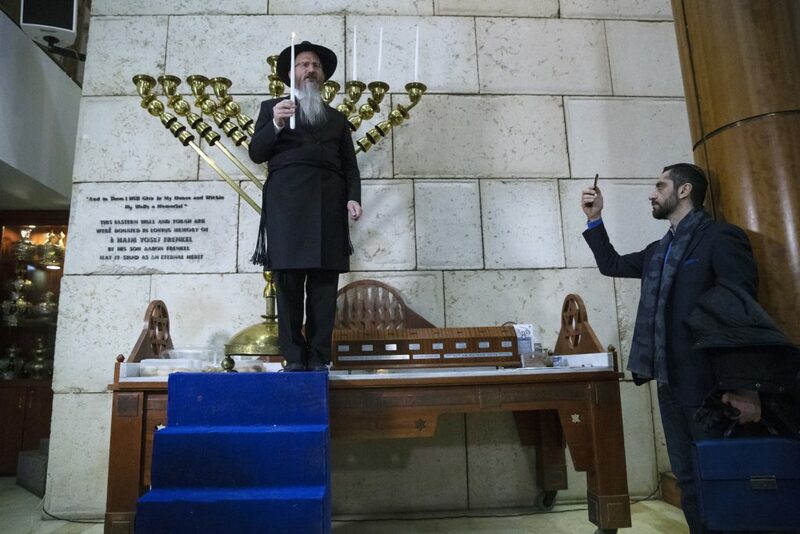 At Yerushalayim’s Kosel Hamaravi, the holiest place where Jews can pray, more than 250 survivors from across Israel lit candles at sunset after feasting on sweet Chanukah treats. Shlomo Gewirtz, the vice president of the Claims Conference in Israel, said in the wake of reports of rising anti-Semitism in Europe, the international nature of the ceremony has taken on increased importance.